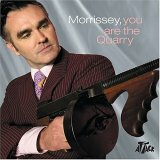 The track was released for Record Store DayMorrisseyMorrissey has shared &#8216;I Thought You Were Dead&#8217;, a new track taken from a 7&#8243; record released just for Record Store Day. On Saturday, vinyl lovers were able to get their hands on a 7&#8243; from the former Smiths frontman which featured &#8216;Lover-To-Be&#8217; as it&#8217;s A-Side. While fans will be familiar with the track after [&#8230;]The post Listen to &#8216;I Thought You Were Dead&#8217;, the new song from Morrissey appeared first on NME.